Simple one pot meals can be so filling and easy to make. They make perfect lunch box meals as well as healthy. I somehow find it very lazy and time consuming to cook elaborate meals like dal,curry and rice. Don't you think so? Especially in Hyderabad when you have water problem touching peaks during summers, cooking gives you a hard time. You definitely cannot eat out everyday and escape day's cooking. 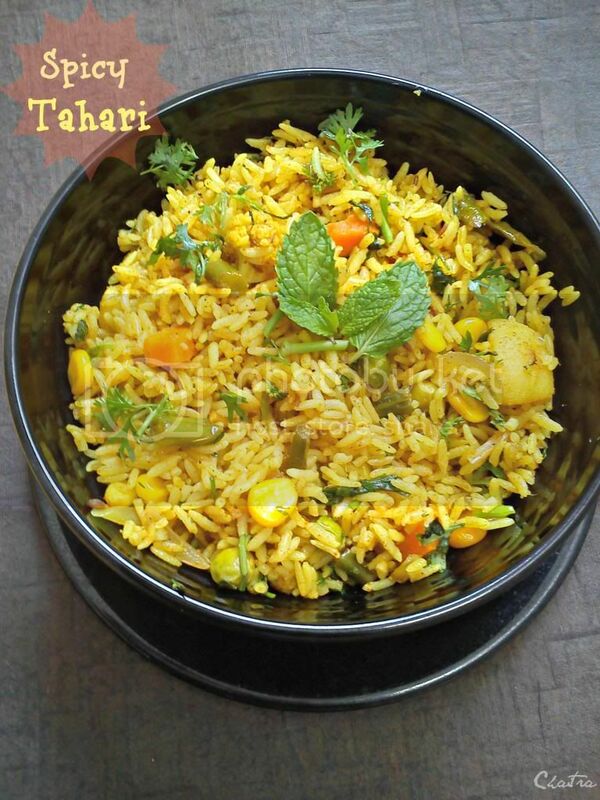 On my quest to find out something easy and tasty to prepare under 45 mins, I found many recipes like Tawa Pulao, Tahiri, Simple biryani, Vegetable Pulao, Paneer Pulao and Bisi bela baath. So all my coming posts will be bachelor special and easy lunch box one pot meals that you can prepare in a breeze without sweating much. Coming back to the recipe, this is a regional special all the way from Uttar Pradesh and happens to be my first post experimenting regional cuisines. Simple and close to biryani but not at all elaborate. You can even make it with left over rice and doesn't need much chopping. Sounds good right? 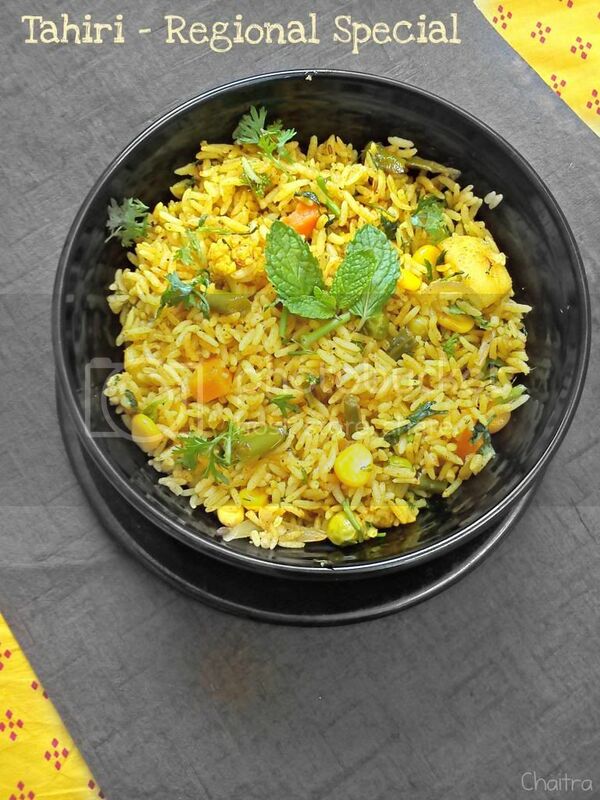 It is very tasty and mildly spiced pulao which definetely finds way to my lunch box often. Cook rice along with 1 and 1/2 cups of water and 1 tbsp of oil. Ensure that your rice is 75% cooked. Heat butter in a cooking pan and fry jeera for a min. Add onions and fry till translucent. Now fry green chillies for about 1 min. To this mixture, add ginger garlic paste and fry until the raw smell subsides. Add all the vegetables along with other ingredients mentioned except coriander. Ensure that vegetables and spices are mixed well. If needed, add 1/4th cup of water to this mixture and cook for about 3-4 mins. You will get gravy consistency. Simmer your flame and add rice to it. Mix all the ingredients well. Cook for 2-3 mins. Add chopped coriander. Adjust spices and salt if required. Transfer the contents onto a serving bowl. Serve hot with raita. You can add any vegetables of your choice. I love to load my rice recipes with vegetables so I have added Cauliflower and corn as well. 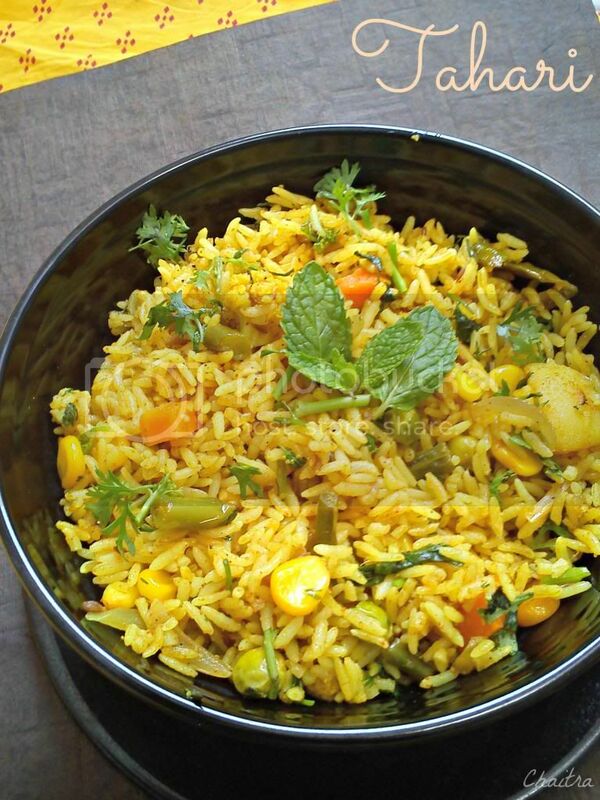 Instead of adding water while cooking vegetables, you can add 1/4th cup of curd to get tangy biryani taste. On a lazy Saturday, when I had almost nothing to do, I thought of seriously working out and concentrate on my diet regime. Guess what I indulged in Zumba dance, my friend Kaavya suggested me that Zumba involves heavy workout and its the best way to burn your unwanted calories without hitting gym. I worked out for about 20 mins and latter part was all huffing puffing..because its been so long that I really thought of pulling myself into workout. Yippiee I feel light....Of course....dancing to a tune like Shake it like Shammi can shed it...right...Coming back to my post, you know the background as to why all of a sudden I cooked this instead of some elaborate meal. This salad is easy to pack in your lunch box or helps as a quick fix when you are in a hurry or have to run for a meeting or a client call. Try this out. Let's hit on the road......and let me stop bragging about my diet etc. Thaw frozen corn and keep it aside. Heat oil in a small frying pan and toss sweet corn for about 2-3 mins and keep it aside. Add all the remaining ingredients except sev. Ensure that all the ingredients are combined well. 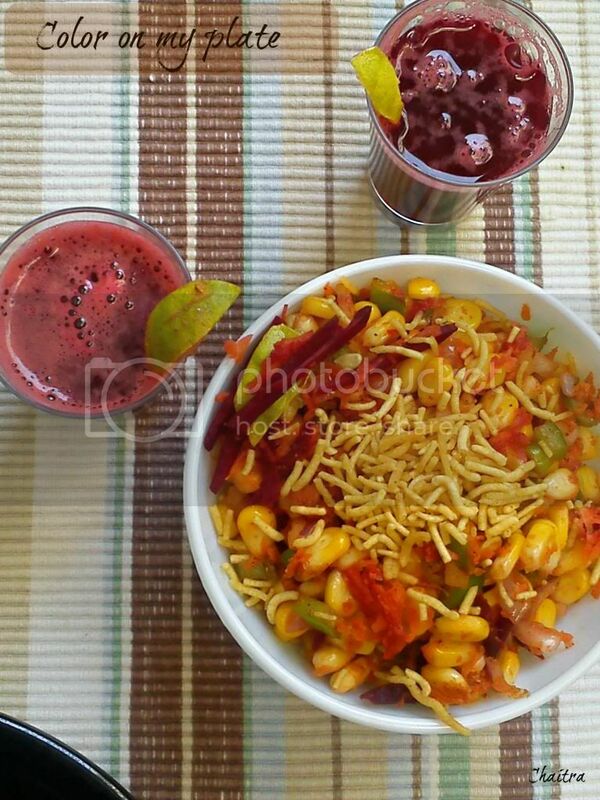 While serving garnish with Sev and serve immediately. 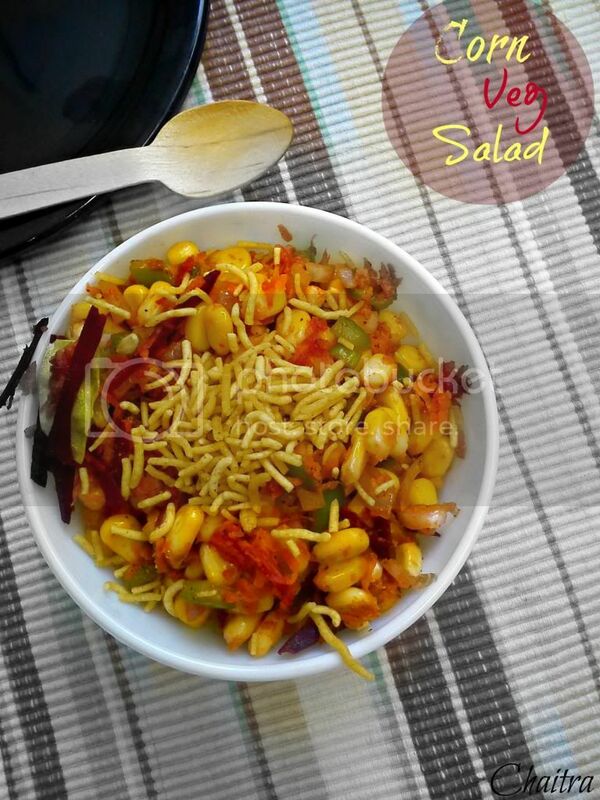 You can butter toss sweet corn which gives nice flavor to your salad. I would recommend this unless you are watching your waist line closely. Add sesame seeds or peanuts to give that nutty taste to your salad. 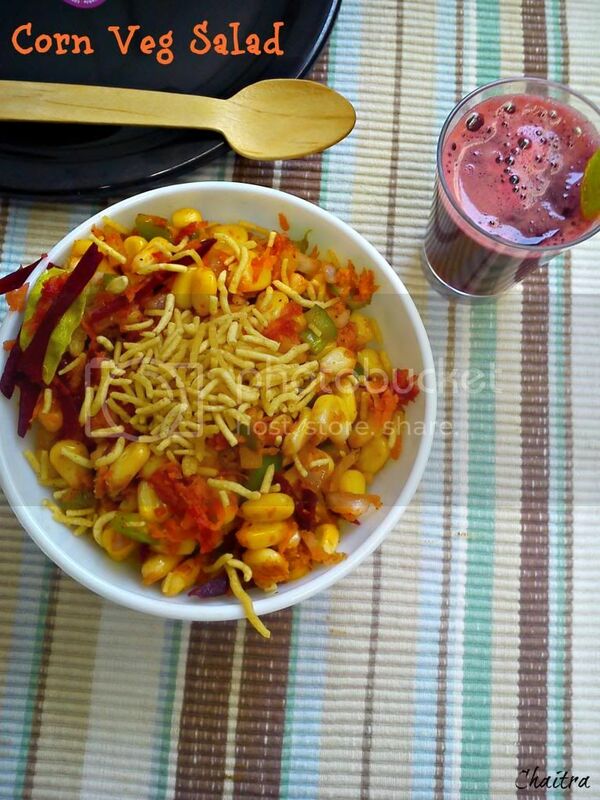 You can use cucumber bits and raw mango along with your vegetables. Somehow I do not like Cucumber and I tend to omit it in every possible way.